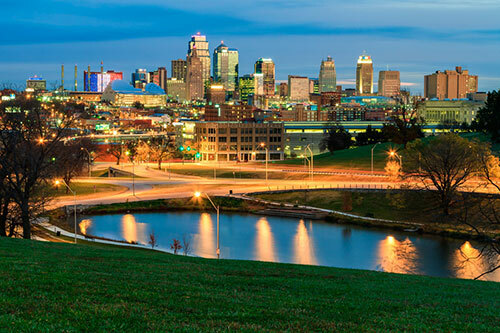 Overland Park stands as the second-largest city in the Kansas City Metropolitan area. It’s located in Johnson County, with a growing population of approximately 185,000 residents. Overland Park covers a massive 75 square miles of land, spanning all the way to the northern and southern limits of the county. Overland Park’s history began in 1905 with the vision of William B. Strang Jr. He arrived with blueprints for a well-planned, self-sustaining community, from which he plotted subdivisions along a military roadway— including what would become Overland Park. Development also sprang up around the historic Santa Fe Trail, a well-traveled route through Missouri and Kansas for covered wagons heading west in the 1800s. More recently, the city was incorporated in 1960 with just over 30,000 residents, and it has flourished since. Tech industries are booming in Overland Park, with companies such as Sprint and Netsmart headquartered here. Overland Park is an influential city, with upscale culture at the Nerman Museum of Contemporary Art, shopping at Oak Park Mall, and family amenities like the nearby Deanna Rose Children’s Farmstead. Top-rated Shawnee Mission and Blue Valley schools are Overland Park’s crown jewels. New Concept Auto Service is proud to provide exceptional customer service and auto repairs for all residents of Overland Park. Our business is located right on the Santa Fe Trail, also referred to as 87th Street in our neighborhood. We have been AAA approved for 30 years, backing all our repairs with a three-year, 36,000-mile warranty. Horse-drawn wagons no longer roll through, but thousands of motorized vehicles retrace the pioneers’ steps as they drive by each day. Be sure to stop when your horseless carriage needs maintenance or service.